We offer online registration for many of our programs. You must be in our system to use online registration. If you were in any of our programs after 2004, you should be in our system. If you’re not a member or a non-member participant, your first registration must be done at the Member Services Desk at your local YMCA branch.Register Online Today! If you know your registered email and password, simply enter your information and click “Sign In.” If you click “Forgot your password?” your password will be emailed to the email address on record. 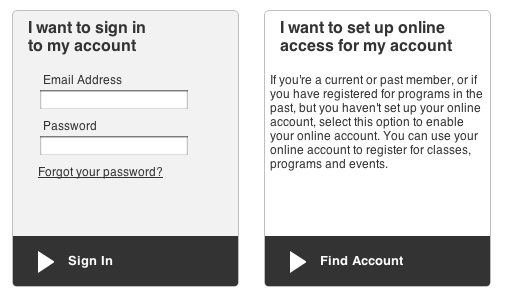 If you have never registered online with the Prattville YMCA, click on the “Find Account” button. Use this information when you are returned to the Sign In screen. Note: If you receive an error after clicking “Find Me,” and you are currently a member or non-member participant, please contact the Member Services Desk or info@prattvilleymca.org to verify your personal information such as name, address, birth date, phone number, and email address. Once this has been updated, you will be able to login and register for programs online. Once you’ve logged in, click on the specific category tag (such as Swim Lessons) that your program is under. Check the box next to the appropriate session or sessions. You will be asked to indicate the person who will be participating in the program. All individuals on your membership will be listed. Note: If a member of your family does not appear in this list, you must come in and add them to your family membership (please see guidelines for family membership). Before checking out, you can click “Register for More Programs” to continue. You will receive a registration confirmation via email. If you do not receive an email confirmation, contact Kathy Asbury at 365-8852 or info@prattvilleymca.org to verify that your email adress is correct in our system.Note: Some email spam blocking tools require that you allow emails to be received from us before you can receive the confirmation emails. Be certain your spam filter allows emails from prattvilleymca.org and from daxko.com. At this time, our online registration system does not accept any form of system credits or financial assistance. If you qualify for financial assistance on programs, or if you have a program credit, please visit the Member Services Desk to register.